Want a new way to use that George Foreman Lean Mean Grilling Machine? Who doesn’t love a warm panini sandwich? 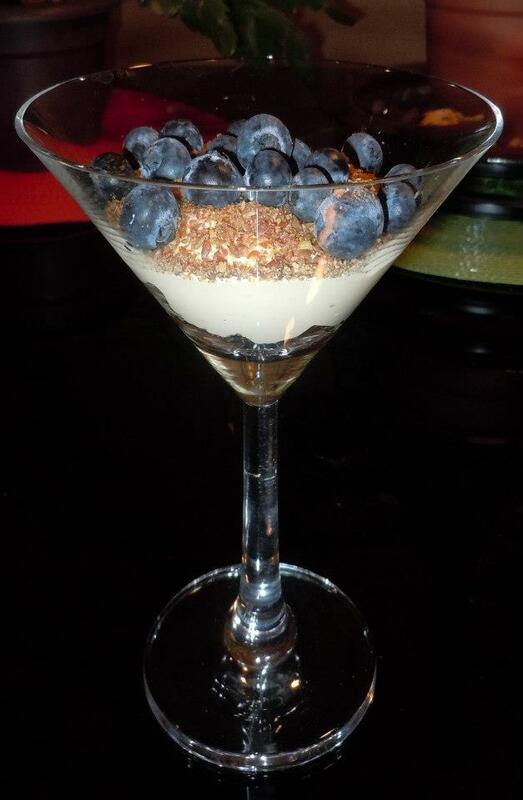 Try this vegan version, and then let your mind get creative and come up with your own versions! Assemble sandwich. Using a panini sandwich maker, or a George Foreman “Lean, Mean, Fat Grilling Machine,” cook the sandwich for 2-3 minutes, while pressing lightly down on the lid. Turn the sandwich over and rotate the sandwich, in order to heat it evenly. Most people don’t even know this is a meatless lasagna until they are told! And as the picture shows, you can make smaller portions, cover it with plastic wrap, and heat it up later for a quick meal! This recipe includes two types of vegetables that are healthy for you cooked or uncooked…tomatoes and carrots. Both contain lycopene, but tomatoes contain the most. The American Cancer Society states on its website that “tomatoes are the most concentrated food source of lycopene…studies that looked at lycopene levels in the blood found that levels were higher after people ate cooked tomatoes than after they ate raw tomatoes or drank tomato juice. This suggests that lycopene in cooked tomato products such as tomato sauce or paste may be more readily absorbed by the body than lycopene in raw tomatoes.” Eating lycopene-rich vegetables and fruits together with a small amount of oil or fat such as coconut oil increases the amount of lycopene absorbed by the intestines. This dish is gluten-free, dairy-free, and meat-free. The only oils used in it are coconut and palm oil. As always, try to use organic ingredients! “Galaxy Nutritional Foods” vegan cheese ( get a package of both mozzarella and cheddar cheese of possible. 1. Cook diced carrots in boiling water until almost soft. At the same time, saute the onions and tomatoes in the coconut oil in a large skillet over medium heat, season with Italian seasonings and sea salt. Additionally, cook the brown rice pasta according to instructions and time it so that the pasta is ready to use when the tomato and onion mixture is still hot. 2. When carrots are almost soft, drain them out of the water with a slotted spoon and put into the onion/tomato mixture, and add the diced mushrooms. Add the ToFurky ground beef, and toss until everything evenly mixed. Allow to cook for about 3 minutes, tossing after each minute. Turn off heat. Add some of the carrot water if it seems too dry. Season with fresh herbs. 3. When pasta is ready, layer the pasta and tomato sauce, sprinkling the chopped spinach and various vegan cheeses on top of each layer. End the last layer with a hefty topping of cheese and a sprinkle of Italian herbs and sea salt. Use what is left over to fill up additional ceramic individual containers and wrap with plastic wrap, freeze or refrigerate, and use at a later date by simply heating until hot. 4. Bake what you plan to eat at about 300 degrees F until cheese is melted. 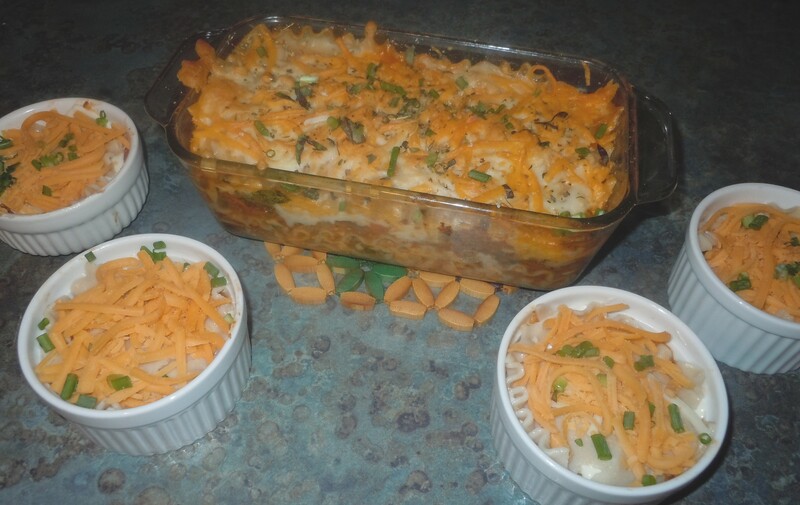 Posted in Dinner, Lunch, Pasta Dishes, Recipe of the month. 1. 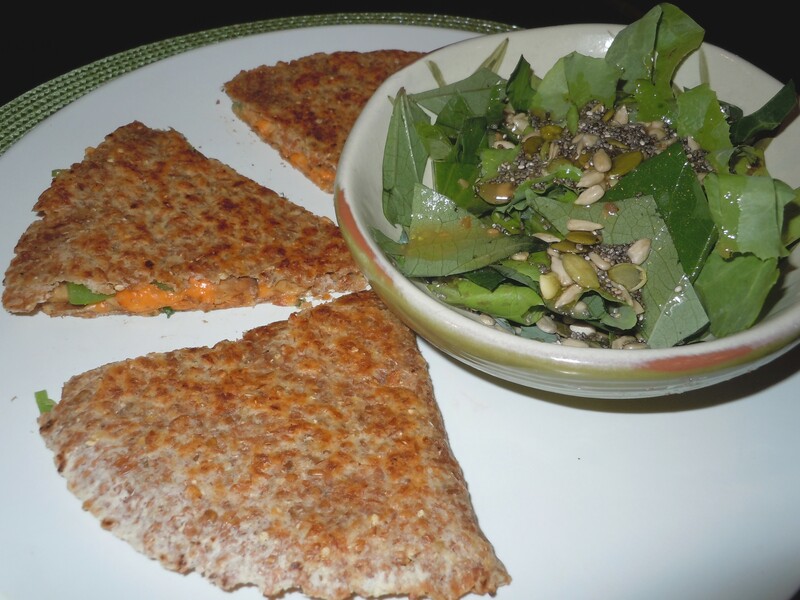 Place a slice of cheese on on half of the sprouted grain bread, then toast both slices of bread just until warm and soft. 2. 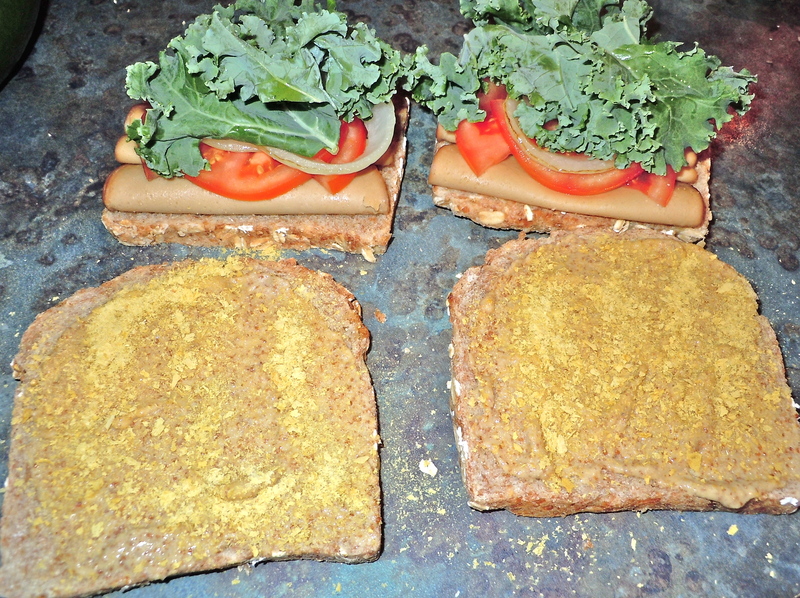 Add mustard and Earth Balance Mayo to the empty slice of bread. 3. 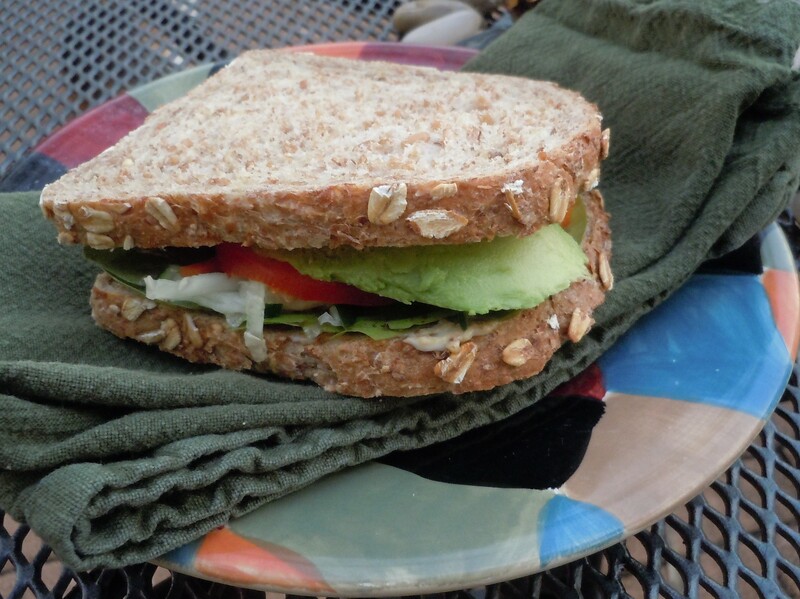 Using a large spoon, lift the avocado out of the shell in “shavings” and arrange on bread. 3. 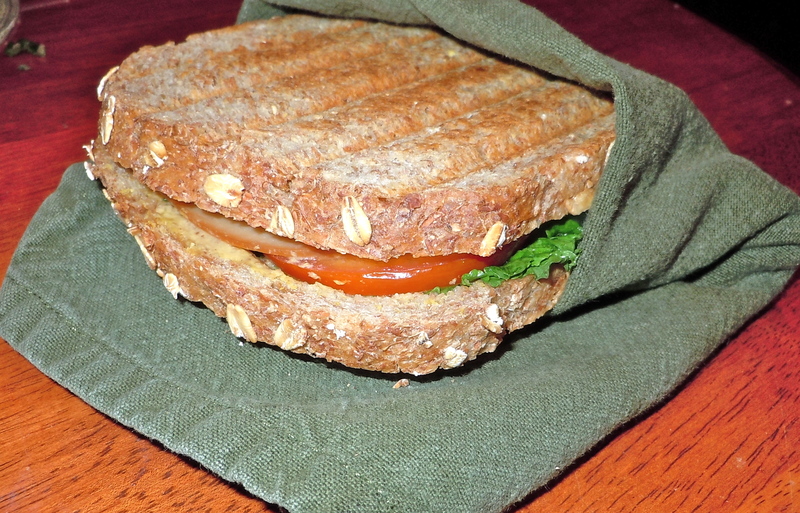 Top with tomato slices, romaine or spinach (or both), and anything else you like on your sandwiches. 1. Cook onion until it just starts to turn soft. Add garlic and diced tomato and cook for 2 minutes longer, tossing often. Using the larges-sized blades on a basic food grater, grate the tempeh onto a plate creating a large pile that resembles ground beef. 2. Add chipotle seasoning to the onion and tomato, toss and cook for one minute. Add the grated tempeh and toss and cook for 2 minutes longer. 3. Add carrots and toss for 30 seconds. Then add the scallions and chives, remove from heat and toss several times. diced tomatoes, guacamole, olive, romaine, spinach, etc. Posted in Dinner, Lunch, Recipe of the month. 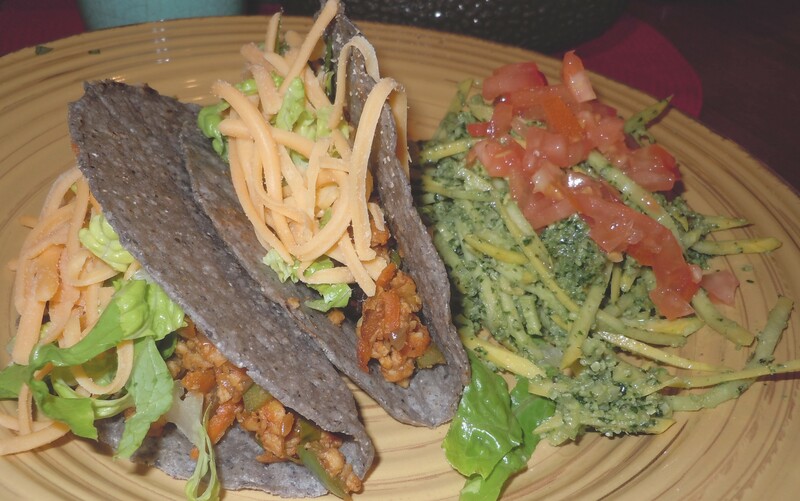 This recipe should satisfy your need for quesadillas! 1. Heat 1 tbsp coconut oil or butter on a skillet that is flat and wide enough to fit the tortilla on it. 2. When hot and the oil has melted, place the tortilla in the skillet. 3. Arrange the diced tempeh strips, green onions/chives, and the cheese on half of the tortilla. Season. 4. Fold the tortilla when it has softened, and the press with a wide spatula. Cook for 1 minute. 5. Flip the tortilla over, cook the other side for another 1-2 minutes. 5. Serve with a spinach and romaine salad or a fresh guacamole dip too add additional alkalinity to this recipe! To make dressing, combine all ingredients, add sea salt to taste, whisk and set aside. 1. Cook the quinoa in simmering water for about 10 minutes (according to package instructions), set aside. Add the curry seasoning and a pinch of sea salt to the water as the quinoa cooks, to flavor it. 2. Cook the onion in 1-2 tbsp coconut oil until it just starts to turn soft, then add the garlic and shredded carrot. Toss and cook for an additional 1 minute. 3. Add quinoa to the onion/carrot mixture and toss. Then add the chives and basil and toss again. Turn off heat and let flavors saturate the dish, tossing once or twice every 30 seconds or so. 4. As the chives and basil flavors are released, gently toast the millet bread. 5. 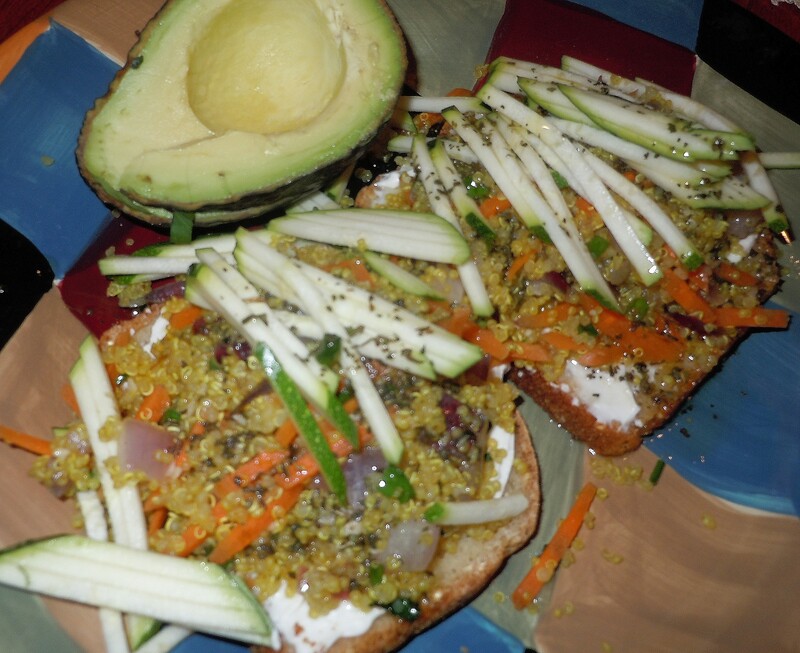 Spread the toasted millet bread with the vegan cream cheese, top with the quinoa mixture, and garnish with shredded zucchini. Drizzle the olive oil dressing over the top, serve with half of a freshly-cut avocado! 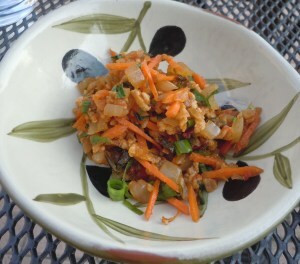 Posted in Dinner, Great for Athletes, Recipe of the month.